A Funny, Beautiful Lady Destroyed by an Evil Svengali? While in college in Kyoto, Tomoko Nakajima was dubbed a beauty. She was even "Miss Campus" at her school's art festival. But Nakajima wasn't just a pretty face. Blessed with a quick wit, she was one of the most popular comedians of her generation. That is, until she seemingly lost control of reality and fell under the spell of mystic, and her life fell apart. Nakajima is one half of the manzai group Othello. The duo took the name because Nakajima is tanned, and her partner, Nahomi Matsushima, is pale—thus, they resemble the board game Othello. From the late-1990s and throughout much of the last decade, Othello were regular fixtures on Japanese television. Nakajima appeared in countless commercials, TV dramas, and she even did voice work for the Cybersix anime. Then, in around 2005, Nakajima starting living with a spiritual advisor. Initially, she was seeking guidance regarding her love life, but gradually, the advisor seems to have taken over Nakajima's entire life. It's rumored that the comedian doesn't make any decision without counseling this female mystic first. While Nakajima's famous wit and figure remained unchanged for years—in 2008 she appeared in a revealing poster for charity—she appeared bloated following year. It was overnight. Nakajima blamed everything from her ex-boyfriend having a kid to being jealous of other TV stars. It wasn't simple weight gain. Something was wrong. She eventually stopped appearing on TV. She was dropped from the shows she appeared on. Worst of all, she eventually stopped leaving her apartment. She stopped paying rent for said apartment. This week, Japan Today reported, a Tokyo city court ruled that the 40 year-old comedian was evicted from the Shibuya office space she's been renting as a production office. Nakajima not only failed to appear in court; she also did not submit any written statements or documents. 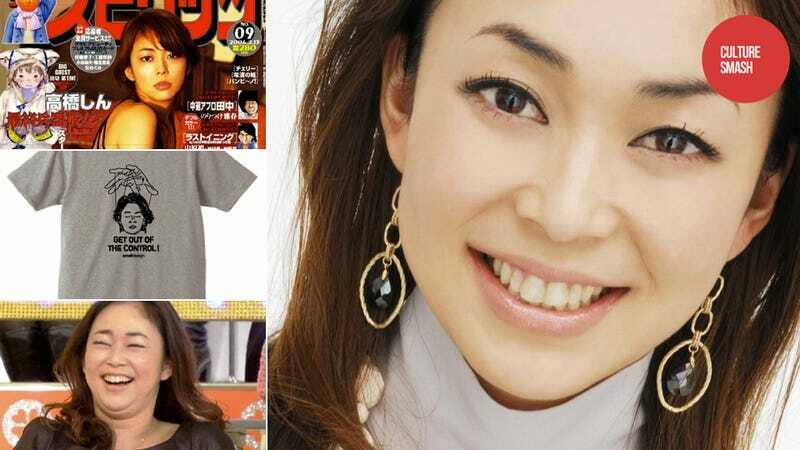 Nakajima landlords are also suing to have her evicted from the apartment she shares with the female who's acting as her Svengali, who is reportedly dictating Nakajima's every move. Every move that seems to be ruining her life. Outside Nakajima's apartment, a man sells t-shirts that depict Nakajima's head dangled from a hand by strings. It reads (in English), "Get out of the control!"